Ever since its Broadway premiere in 2008, the musical “A Catered Affair” has been dogged by a critical debate over what, exactly, it is. Those who approach the work in light of musical conventions often find its unspectacular score wanting. Others have suggested it’s really a play with music. I find the latter perspective more apt, though I would go even further. The almost seamless integration of spoken dialogue and the transcendent expressive effect of singing bring “A Catered Affair” closer to the dramatic form of opera. That was decidedly the experience I had watching – and listening to – the deeply affecting, faithfully verismo production mounted by Porchlight Music Theatre at Stage 773. Directed with great sensitivity and stylistic coherence by Nick Bowling, and acted and sung by a first-rate cast, this show brings forcibly to mind two naturalistic operas, two other tales of ordinary folk living their ordinary lives: Mascagni’s “Cavalleria Rusticana” and William Bolcom’s “A View From the Bridge,” the latter based on Arthur Miller’s play. Where both of those works veer into tragedy when events sweep characters over the precipice, “A Catered Affair” stops short in its plunge toward calamity to make a gentle landing. But the circumstances are highly charged and the characters authentically desperate. Harvey Fierstein’s book for the Broadway musical is based on Paddy Chayefsky’s 1955 television play as filtered through Gore Vidal’s 1956 screenplay. John Bucchino’s wise and witty lyrics are uplifted by his music. One may not come away humming the tunes, but one certainly is stamped by the sum of the work. It is the setting first of all — a modest apartment building in Brooklyn in the early 1950s – that evokes the spirit and milieu of verismo opera. Designer Brian Sidney Bembridge’s rather plain, predominantly beige set instantly establishes a well-ordered home of humble means. Janey, who’s maybe in her late teens, and Ralph, a little older, decide on the spur of the moment to get married – just do it, no relatives or friends invited, no fuss. That’s fine with her parents, Aggie and Tom, who’ve always had to watch every dollar. Besides, Tom, one-third owner in a taxi cab, suddenly has a chance to throw in with another partner to buy out the third guy. But when Ralph’s more well-to-do folks push for a more glamorous wedding, Jane’s mom caves in all the way, to Tom’s increasing mortification. Sounds like a sitcom, and there is comedy — well, comic relief – in it. But “A Catered Affair” is no silly affair. It’s about real people struggling with hard issues; and though there are 16 musical numbers, when one of the characters breaks into song it’s almost always with sentiment from a deep place that cannot be reached through words alone. 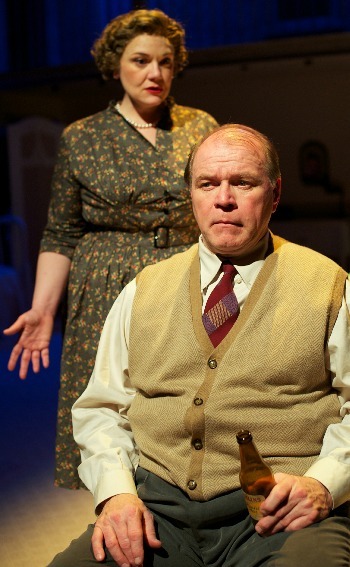 While the wedding of Janey and Ralph (the effervescent, sweet-voiced Kelly Davis Wilson and the centered, sympathetic Jim Deselm) drives the plays, its dramatic center is the marriage, old and worn, between Aggie and Tom. In their portrayals, by Rebecca Finnegan and Craig Spidle, this show enjoys two of the finest performances I’ve seen on a Chicago stage this season. 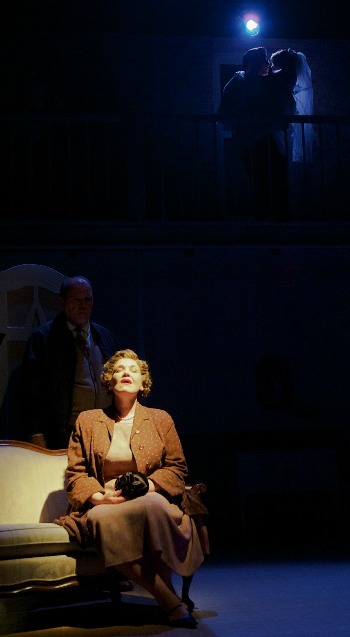 Finnegan’s Aggie is a woman in her middle years filled with regret and resentment for a meager, loveless life that seems already spent and gone. What’s so compelling here is Aggie’s ebb and flow between heartache and the joyful prospect of doing something beautiful for her daughter, something she believes will comfort Janey when the hard times inevitably come. 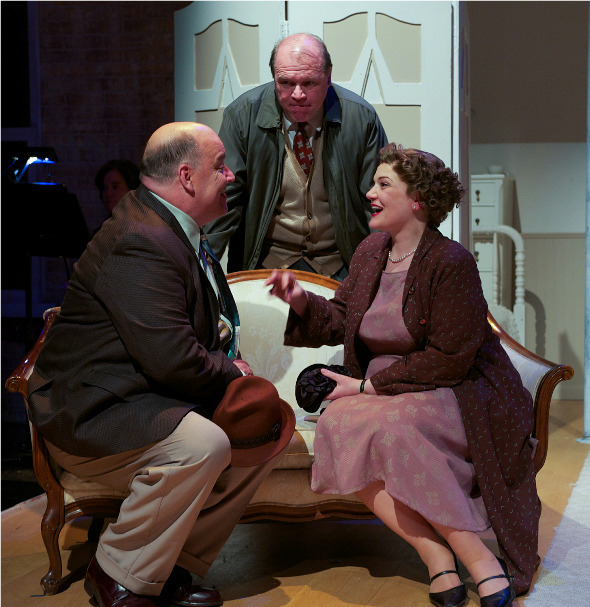 Finnegan also displays formidable vocal means in soulful numbers like “Married,” Aggie’s stunned reaction to Janey’s news, and “Our Only Daughter,” in which Aggie rebukes her husband for resisting the event’s swelling cost. The character of Tom is at once simpler and more exacting to play, and Spidle nails it. He shows us a man who feels he’s been engaged in hand to hand combat with life, who has fought and bled to provide for his family. He’s a sullen figure, neither warm nor expressive – until he hits the breaking point, and all the raw bitterness comes spewing out in the sung tirade “I Stayed.” Spidle makes it a devastating turn, vocally potent and fiercely earnest. Amid all this angst, Jerry O’Boyle as Janey’s gay Uncle Winston – her mom’s brother and a perpetual boarder in their home — provides compassion, comic grace and sensible choices for the reception’s hors d’oeuvres. O’Boyle is a radiant presence with a fine tenor voice whose big number, “Coney Island,” contains the show’s key nugget of wisdom: When you pay your money and take the ride, don’t miss the view. As the bridegroom’s rich, pushy parents, Larry Baldacci and Anne Sheridan Smith head a delightful supporting cast that includes a gaggle of nosy neighbors who assume they know very well what a hurry-up wedding means. Musical director Doug Peck’s adept work embraces polished accompaniment by a string quartet placed off to one side, with piano, bass and clarinet behind an apartment wall. There’s an inviting intimacy about this journey. No matter where you sit for the ride, you will not miss the view.